We’d love your help. Let us know what’s wrong with this preview of The Zodiac of Paris by Jed Z. Buchwald. The Dendera zodiac--an ancient bas-relief temple ceiling adorned with mysterious symbols of the stars and planets--was first discovered by the French during Napoleon's campaign in Egypt, and quickly provoked a controversy between scientists and theologians. 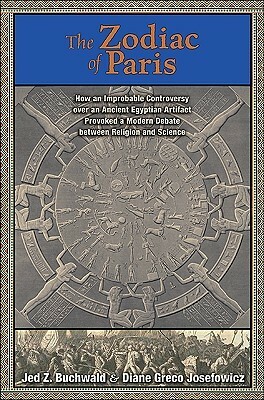 Brought to Paris in 1821 and ultimately installed in the Louvre, where it can still be seen today, the zodiac appeare The Dendera zodiac--an ancient bas-relief temple ceiling adorned with mysterious symbols of the stars and planets--was first discovered by the French during Napoleon's campaign in Egypt, and quickly provoked a controversy between scientists and theologians. Brought to Paris in 1821 and ultimately installed in the Louvre, where it can still be seen today, the zodiac appeared to depict the nighttime sky from a time predating the Biblical creation, and therefore cast doubt on religious truth. "The Zodiac of Paris" tells the story of this incredible archeological find and its unlikely role in the fierce disputes over science and faith in Napoleonic and Restoration France. The book unfolds against the turbulence of the French Revolution, Napoleon's breathtaking rise and fall, and the restoration of the Bourbons to the throne. Drawing on newspapers, journals, diaries, pamphlets, and other documentary evidence, Jed Buchwald and Diane Greco Josefowicz show how scientists and intellectuals seized upon the zodiac to discredit Christianity, and how this drew furious responses from conservatives and sparked debates about the merits of scientific calculation as a source of knowledge about the past. The ideological battles would rage until the thoroughly antireligious Jean-Francois Champollion unlocked the secrets of Egyptian hieroglyphs--and of the zodiac itself. Champollion would prove the religious reactionaries right, but for all the wrong reasons. To ask other readers questions about The Zodiac of Paris, please sign up. A fascinating and scholarly study of the discovery of an ancient artifact and its impact on contemporary science and politics. During Napoleon's expedition to conquer Egypt, French scholars discovered several depictions of the zodiac in Egyptian temples, most notably at Dendera. These were intriguing, of course, because they were old. How old, though, were they? Reasoning from hints in the arrangement of the zodiacs, scholars suggested that they could be dated from the precession of the equinoxes A fascinating and scholarly study of the discovery of an ancient artifact and its impact on contemporary science and politics. During Napoleon's expedition to conquer Egypt, French scholars discovered several depictions of the zodiac in Egyptian temples, most notably at Dendera. These were intriguing, of course, because they were old. How old, though, were they? Reasoning from hints in the arrangement of the zodiacs, scholars suggested that they could be dated from the precession of the equinoxes -- and that if this were correct, the zodiacs had been created (or copied from older zodiacs that themselves had been created) well before the earliest dating for the Biblical Flood. The cast of scientists involved in the subsequent controvery is remarkable. There's Conté (inventor of the crayon), and Laplace, and Fourier. Indeed, Fourier was at this time more respected for hus Egyptology than for his work on the diffusion of heat! I found THE ZODIAC OF PARIS a fascinating read if a bit dry at times. They have taken a moment in history, the bringing to Paris of a pair of stones found in Egypt by Napoleon’s forces, and brought a magnifying glass to inspect the ramifications of this seemingly simple action. The stones, which now can be seen in the Louvre, sparked a debate between the Catholic Church and leading intellectuals of the time. The stones display a Zodiac, a depiction of the nighttime skies, but according to the a I found THE ZODIAC OF PARIS a fascinating read if a bit dry at times. They have taken a moment in history, the bringing to Paris of a pair of stones found in Egypt by Napoleon’s forces, and brought a magnifying glass to inspect the ramifications of this seemingly simple action. The stones, which now can be seen in the Louvre, sparked a debate between the Catholic Church and leading intellectuals of the time. The stones display a Zodiac, a depiction of the nighttime skies, but according to the alignment of the stars, the sky shown depicted a time well before 6000 B.C., the date of creation according to Bible scholars. The authors have managed to take what is now a display of a pair of rocks in a museum and brought to life the swirling debates and controversies, fights and arguments and theological ponderings which accompanied their translation from Hieroglyphs to modern language. This book makes us think and question not only what we know for certain, but more importantly, how it is that we know it. Certainly this book will be of great importance to scholars of 19th century European history, although those who deal with theology may shy away, so much the pity. I won this thought provoking volume through Goodreads. Wow! This book is well researched and came alive to me. I've only put it down only to go online to learn more about points made and to learn even more about the history of both Egypt and France. I love history of both of these countries and have been in my bliss state reading this great book! I'm now wanting to get learning more in depth about astronomy and astrology now! This book is not for those that ant a light read. It's more for those that want depth in their reads. If only I didn't have a Wow! This book is well researched and came alive to me. I've only put it down only to go online to learn more about points made and to learn even more about the history of both Egypt and France. I love history of both of these countries and have been in my bliss state reading this great book! I'm now wanting to get learning more in depth about astronomy and astrology now! I got this book as a goodreads giveaway. It was amazingly detailed and well-researched, and gave me insight into the scientific and philosophical world during a time period (during and following the French Revolution) that I'm not very familiar with. I did have some difficulty understanding some of the astronomical theories, but I really enjoyed learning about the political and religious biases that influenced the attempts to date the zodiac. I really like it. Perfect combination of history and mysticism. Such a good intellectual read. Really makes you think about the effect such a small thing has on the world. Received as an ARC. This was a very interesting presentation of a small snippet of history and the interactions of people, politics, and religion. That the theft of the roof of a temple in Egypt during Napoleon's occupation could involve the king, emperor, and pope, but also people I only knew from science: Ampere, Fourier, Fresnel, Carnot, and others, was surprising and entertaining. This was a really interesting exploration, a bit of a tough read, but worth it for the ideas within. Full disclosure - I got this book for free from a Goodreads giveaway, however all opinions are my own. This book is a bit dry perhaps for the average reader, its a very scholarly tome that requires a certain quantity of historical knowledge to full take in. That being said, its an incredible story for people who love history, archaeology and the like. A certain interest in Egyptian history and French Culture helps because of the piece in question and its role in various stages of French history i Full disclosure - I got this book for free from a Goodreads giveaway, however all opinions are my own. A truly fascinating and informative book, well worth a read! In compliance with FTC guidelines, I received the book for free through Goodreads First Reads.